The first novel in Trollope’s political series, Can You Forgive Her?, was published in 1864, three years before The Last Chronicle of Barset. The two series are intertwined, we first meet The Duke of Omnium in Framley Parsonage, and are introduced to Plantagenet Palliser and Lady Glencora in The Small House at Allington. 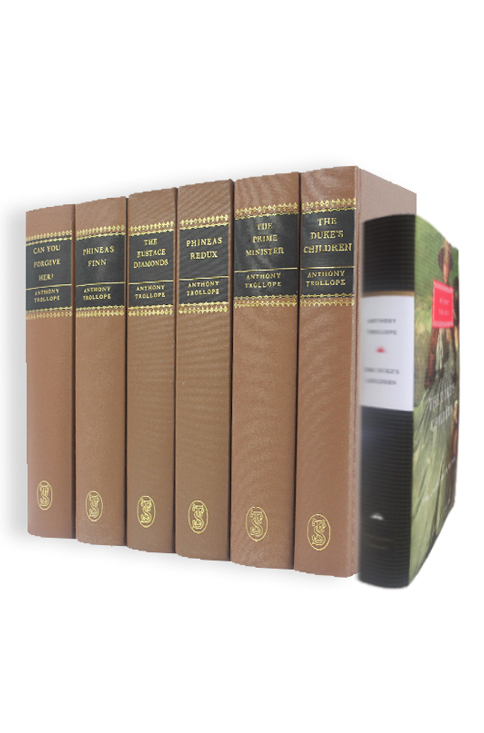 The Pallisers feature to a lesser or greater degree in all of the six novels. Throughout the series we see the relationship between Plantagenet and Glencora grow, until Glencora’s death at the start of The Duke’s Children. Along the way we meet a host of other characters. Alice Vavasor vacillates between marriage to her cousin Frank or Mr Grey in Can You Forgive Her? In Phineas Finn the eponymous hero arrives in London from Ireland to begin his career as an MP and returns in Phineas Redux. Lizzie Eustace provides a diversion from the political with a tale of her jewellery in The Eustace Diamonds. Plantagenet Palliser reaches the pinnacle of political office in The Prime Minister and has to content with his wilful children in The Duke’s Children.